Once a month you can walk through Carlisle’s Lower School and witness something truly special. The laughter and excited chatter spilling out of the classrooms and the beaming faces can mean only one thing – it’s Mentoring Day. For eight years now, the Mentoring Program has been a highlight of school life for the Lower and Upper School students. 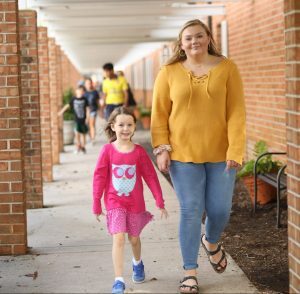 Students in Pre-K through 5th grade are paired with students in the 9th through 12th grades, meeting once a month to play games, draw pictures and take part in other school-planned activities. Former Upper School Director Gayle Jessee and Lower School Director Neal Meyer spearheaded the program as a way for Upper School students to make a lasting impression on a young child’s life, and for the Lower School students to establish a deep connection with a positive role model. Susan Aaron now oversees the program and coordinates monthly activities. She works on updating the mentor pairings as students graduate and new students enroll at Carlisle. At the start of the program, students were randomly assigned pairings but administrators quickly learned that maintaining the same pairings year after year facilitated a much better bond and experience for both the mentor and the mentee. Meyer witnesses that bond frequently as students pass each other around campus. “When one of my students sees their mentor in the hallway, their face lights up. To be acknowledged by an upperclassman is an amazing feeling. It gives each child someone to look up to, and their mentor is someone who will help make their experience at Carlisle special,” she said. 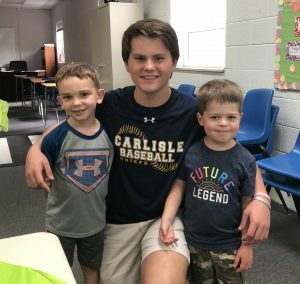 Carlisle School prides itself on being a family, and the Mentoring Program has certainly become an integral part in creating that supportive learning environment.